Allen looked down from the stack of square hay bails to where his younger brother, Mark was. Mark had darker blonde hair and was one inch taller than Allen. Allen manoeuvred along the top of the stack to where Mark was. Allen carefully stepped high to keep the snow from falling down and alerting Mark. He took one more looked to see that he was in the right place and jumped onto Mark. “Uck!” shouted Mark as he fell forward onto the frozen ground. He quickly struggled to face his brother who was on top of him. Mark grabbed Allen’s shoulder and pulled up. Allen fell side ways. Mark rolled to one side as fast as he could. He struggled to his feet, but was surprised that Allen was still on his knees. “Come on,” said Mark as he braced himself and clinched his fists. “Why do you have to be good at everything?” yelled Allen. Mark pulled his gloves off and stood where he was. He might not win this time, but Allen was going to hurt when it was over, Mark thought. “Damn you!” said Allen again as he sat down on the frozen ground. “What the hell do you want?” said Mark. “I want to quit,” said Allen with a tired voice. “What?” Mark said again as he relaxed and leaned over to get his gloves. “Everything: hockey, school, I don’t know. Maybe even this place,” he said as he looked around at the haystack, the fences, and the cattle quietly eating. “Well, I guess you wouldn’t be the first,” said Mark as he sat down on a bail of hay. He pulled his gloves on and adjusted them. “You mean Matthew,” said Allen. “And Kat,” said Mark. Kat was short for Katherine. “I don’t hate Dad the way they did when they left,” said Allen. “It makes sense to hate this place,” said Mark. “I don’t know if I hate this place either,” said Allen. “But you dream of leaving just like the rest of us,” said Mark. “I don’t know,” said Allen. “Things don’t have to be the way they are…” said Allen. “Was that what set you off?” asked Mark. “It isn’t the chores that are getting to you,” said Mark. “That’s probably because your school work isn’t that good,” said Mark. “No one likes to get lousy marks,” said Mark. “You just have to come home after school, get your work done and then you’re free to do whatever you want,” said Allen. “Yeah, right,” said Allen sarcastically. “I am doing the books because I took accounting at school. I see school as the solution to everything,” said Mark. “Yeah, you told me what you thought before,” said Allen. “Yeah, you think you might go to college,” said Allen. “More is possible than you think,” said Mark. “It’s just wishful thinking,” replied Allen. “Why don’t you just take a chance? Do something for yourself even if it doesn’t please Dad,” said Mark. “I guess we should get to the chores,” said Mark. He was tired of the same kind of conversation they had been having all year. Matthew challenged Mark two years before to get his first B at school. Once he saw the B on his report card in math, he tried to get the same marks or better ones in all his subjects. It gave him a feeling of power. His father had always said he would never amount to much; that was why he was going to stay on the farm like his brothers. Mark knew differently. Mark wanted to continue to get the best marks he could. He was in grade ten and his marks would matter once he graduated high school. In the young adult novel Sandhill Cranes, we find what appears to be a calm and carefree farm life turns out to be a tangle of deception with a hidden truth only those who live it know. This fast paced story is about the challenges of family breakdown and the demands of community as Mark and his brother Allen struggle to find a way to do what is right. The surprising turn of events bring them to a better understanding of themselves and their strength to change things for the better. There are surprising changes coming for Mark and Allen who find they must take chances to do what is right. “How did you ever become the editor of the school newspaper?” asked Jennifer Webster. She tossed her straight brunette hair back and stared at Larry. She had just moved to the city before Christmas and joined the newspaper because she wanted to be a writer or journalist. “Who do you think should be the editor?” asked Larry. “I guess it was the computer that gave me this job,” replied Larry. “You’ll find out,” said Larry. “Didn’t he edit the material for punctuation?” asked Jennifer. At the end of the school day Larry had to go to KXOL-TV where he was a youth volunteer. It was one of the things he wanted to try the year before but, now he wandered if he should put so much time into it. His work on the school paper and at Alvin’s was making it difficult. As he walked to the bus stop Larry thought about what he was doing. He had been telling himself for a long time that he would try this or that just to see if he could do it. But, when should he leave something he had set out to do? He stepped back from the curb as the bus pulled up. The air was heavy with the smell of exhaust. He paid the fair and made his way to the seats near the back of the bus. He didn’t like going to the station anymore. When he started he felt important. It wasn’t that he was bored: it was the way he was being treated when he went there that he didn’t like. Larry remembered when he began as a cameraman. He was carrying a camera on the mobile unit. It wasn’t a position usually given to such a light person. Often he would end up hooking power and television cords while the regular cameramen took over. He had hung around the television-editing studio, perhaps doing a little more than he should have considering that he was a volunteer. But, if he could do it, they usually let him have some freedom. That’s how he produced the station’s new Promo. It was used constantly. The production staff knew he had produced it but, Larry wanted to do less work on the mobile and more work in production so he went to see the day producer the last time he had been in. Larry walked into Mr. Baits’ office. Baits nodded his head as he continued to read the forms in front of him. “June! June, where are you?” called Baits. A brunette woman rushed into the office. “Would you get these typed and send these forms off,” he said as he handed the woman the bundle of paper. Larry stepped back into the hall as she walked out. Mr. Baits continued his work and ignored Larry. He felt foolish and small as she stared at him. He walked down the hall. When he was asked to do the Promo he felt excited and important. Soon he felt uneasy when he walked into the Mixing Studio and asked for a videotape. No one responded. He asked again. He explained to those in the room that he was going to do the Promo. He knew where to get the tapes so he walked over to the rack and took one. Larry picked up the camera he needed and began shooting scenes of the studios and the other crewmen on the mobile. Larry wanted to show everyone there what the cameramen were doing. He wanted to show everyone how important that work was. Larry walked into the mixing studio when no one was scheduled to use it and put the Promo together. He handed in the tape in with Station Promo and his name written on it as producer. It appeared on the air that afternoon. No one thanked Larry for his work. The Promo did not show how important his work was. It was just a typical station Promo and now he knew he could do it. Larry got off the bus in front of the television station and looked at the building for a minute. He wandered why he had bothered to get off because he had made his mind up: he wasn’t going in. He was finished with his experiment to see if he could do it. Larry crossed to the other side of the street to catch the bus that would take him back home. “Would you get that?” asked Alvin when they both heard the electric beep that indicated someone had entered the shop. Larry looked over at Alvin and saw that he was sliding a circuit board into a stereo. “You never told me you work here,” she said. “Just a minute,” he said as he turned around and looked at the tags on the radios behind him. “Oh, this one,” he said as pulled the ghetto blaster off the shelf that he had repaired a few days before. Alvin walked in from the back room and stood beside Larry. “I haven’t finished putting in all the screws on the casing for the radio I’m doing,” said Larry. “Sure,” she replied with a smile. “Thanks,” she said as she pulled the chair forward. Larry placed the screws in their holes and screwed them tight. “So you’re a techno-geek too,” said Jennifer. “Just give it a good honest try,” replied Larry. Larry tagged the radio he had just finished and carried it to the shelves behind the counter. He pulled his coat on and the two stepped out of the door. “Let me carry that for you,” said Larry as he took the ghetto blaster from Jennifer. “Where should we go?” asked Larry. “Nothing too fancy,” replied Jennifer. Soon they were in the food court at the shopping mall. “What do you feel like?” asked Larry. “A cappuccino,” said Jennifer with a smile. “Don’t you think that everyone should try different things,” Jennifer asked. Larry shrugged. They stepped up to the counter. Jennifer looked at Larry and gave him a little push. “Sure, how about two raspberry almond muffins?” asked Jennifer. “I’ll try anything,” said Larry. They sat down and Larry looked at the cappuccino in front of him. He picked up a plastic spoon from the try. He dipped it into the white topping and tasted it. He frowned. Larry picked up the cup and tasted it. When he put his cup down Jennifer’s smile broadened and she laughed. Larry felt the smear of whipped milk on his lip. He quickly whipped it off, turning red. “You were just waiting for that, weren’t you?” said Larry, now smiling. “It’s just hot chocolate,” replied Larry. “I told you, you would like it,” said Jennifer as she picked up a plastic spoon and began removing the wiped milk from her cup and putting it on the tray. Jennifer smiled at him and picked up her cup and had a drink leaving the whip on her lip for a moment. Larry laughed. “Why are you working at Alvin’s repair, you don’t look like the type that needs the money. You have your own truck and even though you don’t wear designer clothes like Limi, you dress all right.” They called Cecil; Limi because he always wore limited edition clothes and made sure everyone knew it. “Well, my Mom is an Illustrator,” said Jennifer softly. “He’s still back east. He’s a teacher but he was told that he was not going to have a job next year because of cutbacks. He has only been teaching for a few years. Before that he was a radio producer, and a freelance writer,” said Jennifer. “Who doesn’t it feel normal to?” asked Jennifer. “Oh yes, thank you,” said Jennifer. Larry sat at the same table he always sat at in the school library after school. He had a few more exercises to do before his physics was finished. “Hey Larry, still being a Nerd?” asked Cecil as he walked closer to the table Larry was working at. Cecil look just about normal, thought Larry as he looked up. The green coat with a crest on it fit him better than the baggy large coats he often wore. Cecil’s shortness made the baggy effect often seem more comic. The coats were always from a limited edition, an official team, or company. He would show up wearing a different one every week. Everyone at the school called him Limi, for “limited edition.” Cecil liked the name but wished more people would ask where each coat was from. Larry looked at Cecil with his green coat, old torn jeans, and a black T-shirt that was so faded he wasn’t sure that had once been printed on it. “I just like the feeling of having my work done, Limi,” said Larry. “No,” said Larry. The library was always very quiet after school. “I was going to get a paper from him,” said Cecil. “Oh,” said Larry as he shook his head and looked down at his book again. “Sure,” said Larry. They were both seniors. Larry walked away, looking up each aisle of books as he went, as if he was expecting to see Brian picking a book off a shelf. Larry hurried through the remaining exercises; he had to get to the work at Alvin’s repair shop. He worked twice a week doing simple electronic repairs there. Larry felt a dull burning pain in his stomach as he dropped his pack of schoolbooks by the door and saw his mother in the living room with a drink. “Did you have to go in to work today?” he asked. It was Friday and she usually worked only Tuesdays and Wednesdays as a secretary in a law office. His mother was just over five feet tall and light builds. Larry was six feet tall. He was a senior in high school. Like his mother, he had a light build and black hair. “I’ll be working full time now,” she replied. Larry sat down across from his mother in the easy chair. He was tired after working two hours at Alvin’s electronic repair store after school. He noticed that there was a thick document unfolded on the coffee table in front of her. “It’s not a surprise. He’s finally gone for good,” she said referring to Larry’s father. Larry had been expecting it for a long time. He was home for Christmas three weeks before but he only stayed a few days and was gone again. “We were going to wait for you to graduate high school this spring before we made it final but, it was convenient to get it over with,” she said with a strained voice. Larry knew that there was probably more to it but he didn’t want to know. For Larry, it was all over years ago when his father rarely came home and had little to talk about. He didn’t blame himself anymore for his parents splitting up. “It doesn’t really matter to me,” he said. Larry nodded his head. He had expected it to be this way. He watched his mother as she poured another drink. Soon the strained lines in her face would fade but that never meant things would be fine. He wanted to avoid conversation; it may make her drink more. “Your brother, Derrick, is still in ski-slope college,” she continued. “I told Allen he would have to tell Derrick.” Derrick was two years older than Larry. He graduated from high school with marks too poor to do much, not that he wanted to. “I don’t know,” she said. Neither of them wanted him to disrupt their lives. “Is Alvin going to start paying you?” she asked. Larry shrugged. He had been paid for his work for just over a year but he had not told his mother. She believed that a high school student couldn’t contribute enough to be paid, or so she once said. It was true that Larry had started as a volunteer at Alvin’s repair shop like he volunteered at the local cable television station. He just wanted to see what it was like to work in an electronic repair shop, or in television. The repair shop turned into a job when Larry had shown how fast he could learn. The television work was becoming tedious and boring but, Larry was going to give it a little longer before he decided if he would keep doing it. There was always the other reason for doing the volunteer work: it was to stay away from the house. Before his father left, he would never be sure what it would be like at home when he got there. Once his father stayed away his mother was more unpredictable than she had been. “Maybe we should get something to eat,” said Larry. He stopped short of saying, in his usual joking voice, your favorite? His mother’s look softened as she looked at her son. It hadn’t been an easy day for her. “Yes, my favorite,” she said, “order-in.” she said with an affectionate smile. Larry felt relieved as he watched his mother eat some pizza. She seemed far too thin to him. She would forget to eat but things always went better after she had some food. She had a dark complexion, which helped mask how pale her skin would get when she forgot to eat. “You’re upset about this,” she said after a while. “I guess that is why he came home one last time,” said Larry. “That’s all he ever seemed to be doing when he came home, saying good bye,” said his mother. “No, it was different this time,” said Larry. “It was so…” Larry paused, unsure if he should say it. “It was so quiet.” His mother narrowed her eye for moment, and then nodded her head. “Nothing left to prove,” she said. Larry wasn’t sure what she meant by that but her downward silent glance left him feeling uncomfortable. She shook her head. “It was sad because it was the best Christmas we ever had,” she said. His mother looked at the food tiredly and nodded. After clearing away what was left of the pizza, Larry went down stairs to the basement where he had set up a table with electronic supplies he was given by Alvin. If Larry weren’t sure what to do, he would find some work to do. During a crisis or change he would start a new volunteer position or find a new hobby that would occupy his mind. Each time he would need something more involved to keep him occupied. He looked at the electronic project books that had been stacked on the table and the piles of old electrical component boards that he had taken home to take the good parts off. “What a mess,” he whispered to himself. He picked up a box and began to clean up. Soon the bench was clean enough to work on. He flipped through one book after another looking at the circuit plans for alarms and amplifiers. It was all uninteresting to Larry. He needed much more. He stopped when he reached a plan for a radio transmitter. It could be adjusted to the AM band. It wouldn’t have much power but for a few blocks of a city everyone who had their transistor radios on that radio band could listen to his broadcast. Larry sat in his chair wandering if he could build the transmitter. The list of items he needed wouldn’t be hard to get. The circuits may take some time and the power source would need some work but he could do it. He found a large flat box and began retrieving the components that he would need. He had no idea what he would do with the transmitter when it was done but for now he just wanted to know if he could do it. He knew that it was illegal to operate a radio on the AM or FM band without a broadcasting license. Larry had no plan to use the transmitter but then there was always the possibility that some idea may occur to him by the time he was finished it. Larry felt exhausted. He looked at his flat box with so few parts retrieved after so much work. He rubbed his eyes and decided to go to bed. When Larry woke up it was still dark. He had to go to work that Saturday. He felt relieved that it was too early for his mother to be up yet because after last night his mother would not be in a very good mood. He slipped his feet out of the bed and stared at his stereo and the old reel-to-reel tape recorder. Cables connected the two machines. A microphone stood on top of the reel-to-reel tape recorder. Larry was recording a program. He thought he could put it on a web site with graphics but he lost interest in that project because it was just too easy to do. Anyone could do it. Larry looked at the new computer he had received from his father that Christmas. Beside the computer was a framed picture of his father standing behind his mother who was behind Larry holding him. Derrick stood beside them. They were all smiling. It was summer and they were on holidays in the mountains. He didn’t want to put the picture away. It was a part of who he was but Larry knew that it was over long ago. He remembered that trip to the mountains more vividly than any other holiday. Perhaps that was when he became aware of his parents indifference to each other and the world around them. It was a warm summer’s day when his father took him on a walk along the mountain brook that rushed through their campsite. The cold stung his hand when he touched the water. It flowed fast and deep. Larry had always been afraid of water. They had rarely gone swimming because his father, his mother, Larry didn’t like swimming. Larry was sure that they would stay away from the water’s edge, keeping the brook in sight just to guide them back to the campsite. They walked along its bank, only now and then walking into the forest to look at something Larry’s father had seen, or hoped to see. The roar of the brook was never far away. As they continued Larry became more uncomfortable. He didn’t think they were lost but he became more anxious. “Here!” yelled his father loudly as they emerged from the forest one more time. Larry shuttered when he saw what his father was pointing at. It was a log that crossed over a narrow part of the brook. The water splashed over the edge of the log on the other side of the brook. “We can cross here!” his father said. Why did they have to cross the brook? he thought as he looked at his father. His father didn’t answer he just looked disgusted. Larry watched as his father slowly crept one sliding step at a time to cross the brook. He had made it. Larry watched as his father called across to him. His father’s face was red as he shouted. Larry couldn’t hear a thing over the roar of the brook. He would go out across the brook just to see if he could. That is all he thought. Larry wouldn’t allow himself to think that he could do it because he believed he couldn’t. He made his way half way across when he stopped. Larry couldn’t move. The water roared under him and he realized that he was entirely alone. Larry closed his eyes for a moment and decided he would try to take the next step just to see if could. When he opened his eyes his left foot slid forward and then the right came up behind. Again, he thought about trying his next step. When he tried, it happened. He slipped and stumbled onto the bank his father was standing on. “I told you that if you just believed you could do it, you could,” said Larry’s father. Larry stared at him, feeling confused, then he nodded. He never forgot that he made it because he was only trying to see if he really could. Once in the kitchen, Larry poured some cereal then looked at the clock. He would have lots of time if the truck started. He heard a thud upstairs from his mother’s room. It sounded like a book falling off her bed stand. He quickly took the half full bowel of cereal and put it into the sink. He slipped his coat on and felt for the keys in his pocket. He picked up his gloves and was out the door. Larry smelled the familiar hot metal of the soldering iron as he entered Alvin’s repair shop. Alvin looked more like a toy-maker than an electronic technician, thought Larry. Alvin was wearing an apron and had white hair. He was studying the circuit board in front of him. After a moment he touched the board with his solder iron. “Have you started a new project?” asked Alvin as he continued to frown at the circuit he was working on. “It’s a bit strange,” replied Larry as he tipped the ghetto blaster forward and started to loosen the screws on the back. “It’s a radio transmitter,” replied Larry. “If anyone can do it, you can,” said Alvin. Larry felt uncomfortable. His father was driven and he didn’t want to be like that. “Hum…” said Larry as he pulled the motor drive out of the ghetto blaster that he was working on. “My parents are divorced now,” said Larry indifferently. “I thought they were already divorced,” said Alvin, surprised. Larry stomach jumped as he pulled up in front of his house. There was his father’s dark blue car. Larry wanted to stop, put his truck in reverse and leave but, he knew he couldn’t do that because it too late. His chest felt heavy as he parked the truck behind it. His father got out of the car and looked at Larry. “Hi, son,” he said. Larry was surprised by how much he was looking more and more like his father. They had the same black curly hair, and brown eyes. They were exactly the same height and light build. “Is the truck working all right?” his father asked. “I guess you have heard by now—” said his Dad. “You want to go and talk somewhere?” asked his father. “I guess so,” said Larry. He knew he really had no choice. The two got into his father’s car. Without a word they began to drive. “As you would expect,” said Larry. “Has she quit her job?” asked his Dad with concern in his voice that Larry wasn’t used to hearing. “She moved up to full-time work,” said Larry. His father’s eyebrows moved up in surprise. “I wouldn’t have guessed that is what she would do. I pay her a fair amount in maintenance every month…” his voice drifted off. Larry had heard it before. He had heard too often about how his father had always been a good provider. “We can have something here,” he said as they pulled into the parking lot of a small diner. Soon, they were seated at a table and had their order placed. Larry’s father looked at Larry for a moment and shook his head. “I’m fine. It doesn’t feel like anything has changed to me,” said Larry. Larry shrugged. He was not sure what his father was getting at. They rarely talked, but he must have some reason for wanting to talk now. “Well, I thought now that the divorce is all over I could get to know you better,” said his father. “Who knows what is right for Derrick,” said Larry. Larry shuffled in his seat. He really didn’t know what he wanted to do after he graduated high school. He knew he should have been applying to colleges and universities by now if that was what he wanted to do. The question of what he was going to do had been put off because, he hadn’t been asked, or forced to answer any questions. His father’s interested look made Larry realize that he had expected that the question had been decided. The only thing his father was expecting was to find out what the decision was. His father’s expression turned to one of uncertainty at the silence. “I haven’t decided yet,” said Larry. “What about sciences?” said his father. “You are quick with computers,” said his Dad. “What about being a programmer?” asked his father in disbelief. “The question is how many times can you write the same program and keeping selling it?” said Larry. “You have a job?” his father’s expression returned to surprise. “Yes, I have a part-time job,” said Larry. He didn’t care if his father knew. Maybe, thought Larry, if he knew that I was doing a job he would relax. “There are those fast answers again,” said his father, irritated. Larry’s face grew hot. He hated any kind of comparison between himself and his brother. Larry stared. He had no idea that his father had been thinking of his future. “I’ll remember that,” said Larry. In the young adult novel Just Listen, Larry a high school senior, is doing well, edits the school newspaper, and has a job, but he has many secrets. He learned that some secrets have helped, but others haunt him everyday. He works to find a way to cope with his mother and brother’s substance abuse, family break down and his own confusion about what he is going to do when he graduates high school. Just Listen has many unexpected twists as Larry finally figures out what he must do. “What did you say your name was?” asked the heavy-set woman as she cracked another egg onto the grill. Ed was stirring a pot of steaming cereal. “Just about thirteen,” Ed lied. Ed remained silent a moment. “No—I’m fine,” he replied. Bill and Gregory were the first to arrive. Like every other morning, the town’s only taxi arrived and the two slowly opened the door and climbed out. Ed didn’t know why a taxi brought them. It seemed odd to Ed at first, but as he spent time in their world, things that seemed strange became normal. He watched out the window as the hunchback boys came to the door and walked in. Their faces were red and cold just like everyone else. They had thick lips and crooked stained teeth. Bill had a huge lump on the right side of his nose that made it look crooked. Gregory didn’t appear to have any nose at all. Their cheekbones were low and heavy. The heavy bony mass of their brows made their eyes look small and sunken. Their hair was thin, making them look slightly bald. They both had short, stocky legs. Ed watched as the two helped each other take their boots and coats off. This silent ritual occurred every morning and every afternoon when they left. Connie was different. She would skip and jump as she came to the small building. There was no one with her. “La-la, ta-ta, da-da.” She would come in. Connie was always dancing to the rhythms of some band playing again and again, somewhere in the light of her mind. She was always there—wherever that was—smiling, always happy. “Ta-ta, la-la, da-da,” she sang along as she took off her coat. She was not physically different like Gregory and Bill. She was overweight for her height, but at eleven years old it seemed right. From a distance, she looked like any other girl. Tom came next. He was he oldest and the biggest. He came down the street from the same direction as Connie. He had abnormally big boots. Tom never looked around. He walked with his eyes straightforward and his chin stuck far out. Like Gregory and Bill, he had a pronounced hunchback and heavy brow. His arms were long and bulky and his legs were bowed. He looked old at nineteen. Kathy and Bob came on one of the early school buses. They arrived as the rest finished their breakfast. “Oh but Connie,” said Kathy as Ed came out of the kitchen with fresh toast for the two that just arrived. Kathy was at Connie’s side, her coat still on. She was cleaning some hot cereal from Connie’s blouse. Connie was sitting still and looking down at the mess. Ed was surprised. For the first time since he has been helping, Connie was still, not humming. “Oh but, oh but,” continued Kathy. “Yes,” said Kathy quietly as she did as she was told. “I saw a nice car today,” announced Bob. Ed felt comfortable as he sat down at the small table on the far side of the school library and opened the book he had chosen for his book report. He looked up and noticed Carleton sitting down beside him. “Find a book to do your report on?” he asked. “I think I’ll do this one,” he said as he patted the book he had in front of him. “That’s good,” said Ed, unsure of why Carleton had come to sit down beside him. Ed looked up from his book, surprised. Carleton stared intently at Ed. He shrugged. “For what?” asked Ed. “Getting the guys off me the last couple of times,” said Carleton. “I sure wish I was like you,” said Carleton. “Your Mom is a teacher and your father is a lawyer. You have to be smart,” said Ed. “It’s not that much fun running either,” said Ed. “It’s better than just having to take it,” said Carleton. “If you fight back, they really let you have it. If you tell, the next time it’s worse,” said Carleton, embarrassed. “Why did you do that anyway?” asked Carleton. “I didn’t like the way he could do that,” said Ed. “It’s like you are having a fight with him and you’re winning,” said Carleton with a smile. “Hey look, the two losers sitting together,” said Robert loudly as he walked over to the table they were sitting at. Carleton quickly looked away, but Ed stared at Robert as he approached. Ed felt calm. He knew that he was okay in the library; Robert wouldn’t start anything physical. Ed didn’t move he just watched as Robert stepped up to the table. “Hey, you scared to talk?” asked Robert with a smile. Robert stepped back from the small table, shocked. As he watched, Ed thought he looked as if he had just been punched. “I’ll get you,” stammered Robert. Jennifer began laughing with Jessica. Robert stepped forward and hit his fist on the small table as he felt his cheeks burn. Ed just looked at Robert passively, and then looked at Robert’s fist. It seemed small to Ed. “I’ll be waiting,” said Ed to his own surprise. He meant to say he would be watching, but it was too late to change what he had said. The girls behind Robert were silent. Robert motioned to his friends and quickly left the library. Ed looked across the table to Carleton. He stared back wide-eyed. He looked like he hadn’t breathed the entire time Robert had been there. “You shouldn’t have done that,” he said excitedly. “It doesn’t change anything,” said Ed. “They have been really watching me for weeks now. They have done everything they could to get me. They’ll just keep trying,” said Ed as his heart began to pound. “They would have anyway,” said Ed. Carleton was right, he really shouldn’t have done it, but it just came out. Ed had been thinking of saying those things to Robert for a long time. He never thought he would get a chance or have the guts to say them. Robert may have a better reason to try to get Ed now, but Ed now had a reason to be careful. This could be a good thing, thought Ed. He had always been very fast, now he would be much faster. At the back of Ed’s class, there was a small study room and a small storage room. In the storage room on the left, there was a small shelf of books. Ed had finished with the atlas he was looking at and made his way to the small room without noticing that Mrs. Brown, his teacher, was not at her desk. Mrs. Brown was only an inch taller than Ed was. She had dark brown straight hair that touched her shoulders. Ed thought he was too thin. She wore a pair of large round glasses. As he stepped close to the door of the small room, he heard her voice. “Robert, I didn’t give your assignment a mark,” she said. “Why?” Ed heard Robert say in a whisper. “They weren’t that bad,” Robert pleaded. “You know I have to tell Mr. Ryerson about this soon.” Mr. Ryerson was the manager of the hockey team and the rink. Ed noticed Stan staring at him. Ed turned and made his way back to his desk. He could return the atlas later. All the students had left the special school except Connie. Ed watched as Darcy pulled Connie’s coat on and zipped it up. She stepped up to where Ed was and looked out the window. She nodded and turned. “Okay Connie you can go, he’s waiting for you,” she said. Connie swayed from one foot to the other and until Darcy opened the door. She stepped out and walked to the curb of the sidewalk. She paused and stared across at the boy who was waiting there. It was Dwain, another player on the hockey team. He was the same size as Robert and had dark hair. Ed could not remember ever seeing Dwain talking to Robert in class. But then, Ed had noticed that Dwain never seemed to talk to anyone. Dwain looked both ways and nodded to Connie who was looking at him. She did not look side to side, she just stepped out onto the street and walked to him. Ed quickly helped with the job. “Like Dwain’s family?” asked Ed. “I guess so,” said Ed. Edward Walker was going to get involved—he decided. He walked out of the school and looked across the white snow covered field that was their playground in the summer. The building was white too, but its walls looked dirty. The large windows were covered with shapes of all colours cut from paper. “That’s where the rejects go,” Ed remembered one of his classmates said. Stupid, he thought as he began to walk across the playground. The building was divided into two sections. One was the classroom. Three walls were covered with shelves. The other wall had a small blackboard on it. The second section was the recreation area. Off to one side was a small kitchen. The kitchen had one door and a small square opening where plates of food were pushed through. “No.” replied Ed. His hands felt sticky and clammy as he watched Mrs. Thomas dry her stout fingers on a tea towel. Her grey hair was gathered into a loose bun with about a quarter of it falling to the sides. As Ed walked passed the back of the hockey rink, he saw the usual group of boys crowded around a fight. They were cheering; first one and then another would kick at whoever was in the centre. If they’re so tough thought Ed, why do they need to help each other fight? Ed never understood the idea of fighting even when he played hockey. He always felt puzzled when he was arguing. A friend would ask, “Do you want to fight about it?” It made no sense. He just didn’t fight. He believed it made him a better hockey player when he used to play. If he wanted to avoid fights, he had to skate fast enough to get away from trouble. He practiced skating more than anyone so that he could easily out skate the other boys. He would rather have people call him yellow than have a fight behind the gym at three-thirty. Ed watched his classmates’ fight and play. He was often surprised by the how fast a game became a fight. He always preferred to watch. Robert was different. He would beat anyone that stood around long enough. Everyone was careful when the muscular blond Robert arrived. Even though Robert was the captain on the hockey team, he would be the first to drop his stick and let it fly. Half the time he was the one behind the gym or the hockey rink at three-thirty. None of the guys wanted to scrap with Robert. At least that is how Ed remembered he had been told it was. When he thought about it, he realized that every scrap he had heard about, Stan, Alex, or sometimes Wade, Robert’s brother, who was fighting. Robert just told them what he wanted them to do. That is how it was at least as long as Ed had been around. Ed’s classmates didn’t know how he was at fighting because he had just moved to this town four months before. That alone was enough to make his classmates try to fight with him. They would try to corner him or taunt him. They would chase him now and then, but even though Ed was muscular and heavy set, he was faster than any of them. He would dodge them and be on his way before anyone could get him. It made them more curious about Ed, and Ed knew it. He enjoyed playing fox and hound with them. He hadn’t been caught and intended to keep it that way. Ed walked closer and closer to the small group; curious about whom they were beating up this time. He watched the alley behind the rink, as he got closer, planning his run out of there as soon as they saw him watching. His heart pounded. They all had their hockey equipment, which Ed knew was an advantage for him. “Hey, it’s Ed!” called Stan, one of the boys at the circle. The circle opened up and Ed could see by his bulk that it was Carleton again. He was overweight and never fought back anymore. He couldn’t run fast enough to get away. Ed was off, but he avoided running straight down the alley like they would expect him to. He ran down the alley the length of two back yards and jumped the fence. He felt panicked when the snow was deeper than he was expecting. He looked back quickly. The boys chasing him were just dropping their bags of equipment at that moment. Their clumsy efforts to run at first with their bags had given Ed a head start. He rushed forward through the snow lifting his feet as high as he could. If one goes around the path two houses down they may catch me he thought. Ed didn’t look a second time to find out if anyone had. He hurried to the side of the house. He heard the grunts of the boys behind him falling into the deep snow. In a moment, he was rushing to the shovelled front walk. He looked both ways as he ran and saw no one. He turned to the right and away from the walk that one of them may have been on. He kept running as fast as he could for the main road that was connected to the crescent. Beyond the main road he would run across the open baseball field that had one path down the middle. If he kept his pace up he would have a moment on the other side to see how far behind the other boys were. At the other side, he turned and looked. He saw no one. Either they had given up or they had lost a lot of time in the deep snow in the back yard. Ed had learned that he couldn’t take any chances; he turned and continued to run. Soon he would be home. Ed was panting as he stepped into the side door of the small house his mother was renting. The side door entered the kitchen where his brother and sister where sitting at the table with their schoolbooks. He pulled his backpack and coat off as fast he could. He was too hot. “It’s not as hard as you think. “It wouldn’t even hurt that much,” Martin urged. “He’ll get beaten up soon enough,” she added. “I think I should do it myself,” said Martin as he made a fist and stood up. His mother looked at him and shook her head. She felt bad that Ed had acted different ever since his father left. He didn’t play hockey anymore. It was the one thing he shared with his dad. He didn’t seem to be interested in anything. She blamed herself for the change in Ed, his father leaving, and the way they lived. Ed’s mother was short, and she thought she was a little too heavy. Her hands had long, elegant fingers. They were skilled hands that served her well at her job as a seamstress in the small factory in town. “Yeah, I guess I should have really laid into Ed a long time ago,” said Martin. His mother looked at him with disgust. She grabbed the oven mitts and pulled out the meat loaf. “Yuck, not that stuff again,” Kate groaned. “When you’re making the income for the house you can choose what we eat,” said her mother quickly as she placed the pan on the top of the stove. She pulled her hand from the mitt and shook it in the air to cool it off. They kids did as they were told. They ate meat loaf, potatoes and one quarter of a tomato each. “I’m tired of this,” said Kate as she toyed with her slice of meat loaf. “I do what I can,” said her mother quietly. She knew it was more important to keep them all off welfare than to have more money. She had been told that with three kids she could get a little more from welfare than she was making at the factory, but she wouldn’t consider it. Being separated was bad enough, accepting welfare would be worse. Their father had left to go west when he couldn’t get a job in Witter, the last town they lived in. After trying to find a job in Alton, he realized he would have no more luck there. He packed his bag soon after they were in this town and their mother had started her job at the factory. He would go west, get a better job, and send money. If he got a good enough job, he would send for them. They hadn’t heard anything from him in three months. They had heard it before. They knew that they were never allowed to say they couldn’t do something, at least not until they had truly tried to do it first. “I’m going to take that job at Jensen’s store,” said Kate. Her mother looked at Kate surprised and embarrassed. “I don’t think we really need the money that bad,” she said. Her mother looked at her feeling helpless. Her throat felt dry. “An excuse for what?” asked Kate. “Kate, you’re not going to turn out like me!” said her mother with force. Kate stared at her mother quietly. “I don’t really know what I want,” said Kate. “Then it’s important to keep your options open. That is the real reason to work hard in all your subjects at school,” said her mother. When she talked about something she believed in, she would talk too much, thought Kate. “Yeah,” she said. “I’ll be watching your school marks,” said her mother again. “I’ll go right down to the school if I hear there are report cards out and I haven’t seen yours. I’ve done it before,” she said as she looked at Martin. Martin looked down at his plate feeling his face become warm. “There is always a way, if you believe,” said her mother. Ed was tired and getting into bed felt good. He lay quietly watching the shadow of the leafless apple tree that was casting its shadow on the far wall of his darkened room. He remembered how much he liked hockey, the feeling of freedom on the ice. His Dad had told him that he didn’t look like he should even be in this league; he could skate far too well. Ed remembered the speed and the control. He could get the puck and move it down the ice fast. He would always be waiting for his team mates to catch up. Ed remembered the surprised look on his Dad’s face that day when the team had won a game and they were just leaving the rink. “Hey, wimp, we’ll get you next time,” said a large defensive player who was getting on the bus. “I guess he doesn’t like losing,” said Ed’s Dad. “He’s the same as the rest,” Ed said. “They say that too?” asked his Dad, surprised. Ed sat up and looked at the darken window of his room. It was a large window that was made up of eight smaller panes of glass. “That’s how they used to make windows,” he remembered his Dad saying when they moved into the old house. All the windows in the house were made up of these small panes of glass. No one seemed to know when the house had been built, but it must have been a long time ago, thought Ed. The hardwood floors had dark gray areas along the walls. In the places where there was the most traffic, the wood was worn to a concave path. When they first moved into the house, his Dad had pointed out the screw holes that had held a hand pump by the sink. “No way, they couldn’t have hand pumps in the kitchens of houses in towns,” said Martin. “Let’s see,” said their father as he walked to the basement door near the back door. He turned on the lights. In a moment, the two boys and their father were looking at a concrete tank in the corner of the basement just under the kitchen. The two boys looked at the red brick platform the furnace was on. “They didn’t have a toilet, at least they didn’t have one indoors,” said their father. The two boys looked at each other. “That sounds interesting,” said Ed. The two nodded as they backed away from the darkened room. In the 1990s I was working as a teacher with students that had been facing challenges in their home lives and at school. Tapping experiences from my own youth I wrote several young adult novels. Two Streams, is based on a short story of the same title, broadcast on CBC radio in 1986. Two Streams is a fast moving story about Ed, a new kid who refuses to follow the crowd. He finds himself at odds with his classmates, especially Robert, a bully who is the captain of the hockey team. Ed refuses to be told what to do by his brother or by his classmates. Ignoring their threats, he volunteers to help with special needs children. When he is challenged, Ed discovers that he has the inner strength to do what he thinks is right. 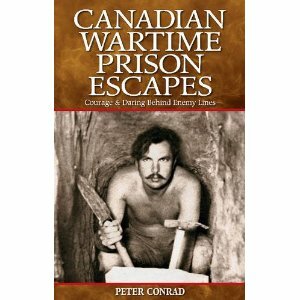 After completing a contract with The Heritage Community Foundation as a Senior Editor and Writer from producing content for the Alberta Online Encyclopaedia in 2006, I signed a contract with Folklore Publishing in Edmonton, Alberta for the book Canadian Wartime Prison Escapes: Courage and Daring Behind Enemy Lines, published in 2007. Critics complained, as the book was focused on the young reader, with each chapter written so they could stand-alone. This format demanded that each chapter would repeat some basic facts for the reader rather than simply referring to another place in the text. I liked going to the baby sitters which was a family of two older sisters and one of the sister’s husband; I never really knew who was the married sister, and could remember their names, I just called them the Luftwaffe family, because the husband, a quiet and kind man had been with the German air force during the Second World War. This made perfect sense as they ha always said that they were in the Old Country fighting and were they were done they came to live in Canada. They had retired from the war, which continued as my friends and I knew that the Second World War was still continuing at the time, in the mid-1960s. Every time you turned on the radio there was only big band music. There was Verra Lynn singing about how we all meet when the light back on all around the world. You could see the black and white newscast of the War on the new televisions we were all getting at the time, and there were daily tests of the air raid sirens at noon in town, with one situated just outside Mountain View School. The siren sounded at night to let the volunteers of the town’s fire department know they had to hurry to the station for a fire. Perhaps the fire was because a bomb had been dropped. No one had told any of us about the DEW Line, the Distant Early Warning Line in the far north to monitor the movement of Russian bombers over Canada and into the United States, an institution of the Cold War, not the Second World War. When we had a Second Grade discussion about what we wanted to be when we grew up, almost every boy and girl answered that we wanted to be one of the services. The girls were going to enter the Women’s Division of the RCAF, or the Naval Auxiliary. The boys were scattered through all of the various services, as I was going to be in the Royal Canadian Air Force. The teacher’s expression was amused at first and then it turned to confusion and concern: there was no major military facility attached to the town. There were survival-training facilities at Blue Lake, but nothing to suggest that we were all related to military families. “To fight in the Second World War,” I said. “The Second World War,” she said, confused. “We want to help win it,” said Greg, a classmate. “We did,” she said without hesitation. The class roared with excitement. She quickly made her way back to her desk, disoriented and speechless.